Fabrics: Anna Maria Horner Garden Party & Good Folks fabrics on front and back, Kona Celery solid on front, Kona Deep Rose for binding. Quilting: Straight line based on Felicity's Oceanic Supernova Full Frontal. Had to make this quilt based on the pattern and the name and decided to keep the because it fits perfectly. 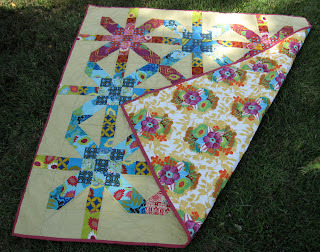 Knew right away that I wanted to make this quilt with my AMH stash. If you check out the bottom center block you can tell that I was running out of reds! My younger son helped me choose the binding color - I had the front and back laid out on the living room floor with my Kona card and he came along and helped me pick out a color that would work - I wanted a binding that would frame the quilt, not disappear. Brought a block to school last semester to show fellow students and will always remember the remark of how "psychedelic" it looked. 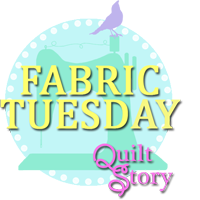 Linking up to Sew Modern Monday, Fabric Tuesday and Manic Monday Linky Party. Thrilled to have completed this quilt! OH.MY.GOODNESS! Susan, it is beautiful and fantastic! You did such a nice job and I love the binding you & your son chose. Very nice!! Oh my goodness this is BEAUTIFUL, Susan! I love everything about it - AMH was a perfect choice of fabrics. And I'm so happy my quilt helped you figure out the quilting - that's always the hardest part for me so I am delighted I helped someone else with that bit. Oh wow - that quilt is stunning!! What a fantastic job! It looks so great! Your son has good eye. The binding works really well. SuperFab SuperNova! It's super nice (and groovy). 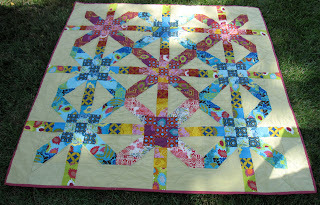 I love the bright binding, framing your quilt. Great job! Congrats on the finish. I have clicked on to your blog about 4 times to tell you how wonderful it looks, yet I keep having things come up that I have to take care of. So here we go. It is wonderful! 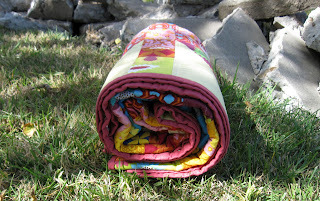 Friendship Through Quilting and a Giveaway!